American sculptor Mark Davis has been creating fanciful and meticulously constructed mobiles for 25 years. Originally from Connecticut, Davis began his career as a sculptural jeweler and has since had numerous gallery and museum exhibitions in the Boston area and beyond. With an emphasis on spatial relations rather than definable representation, the artist's use of color and form bring to mind the compositions and abstractions of Henri Matisse and Paul Klee. Davis is currently working on a number of important public and private commissions, including a major exterior mobile for Ann & Robert H. Lurie Children's Hospital of Chicago. 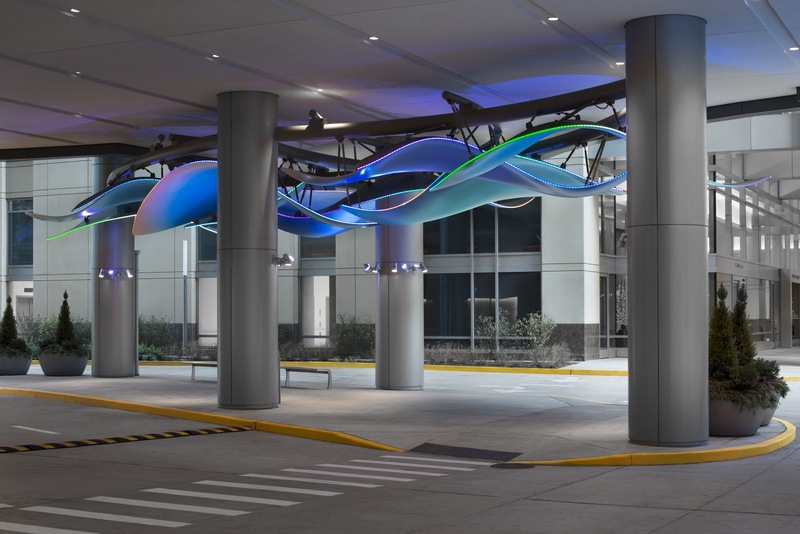 This large-scale installation spans approximately 70 feet long, 30 feet wide, and 10 feet tall, and is an exciting and inviting addition to the Hospital entrance. Healing Waters was dedicated on November 15, 2012. This blog is operated by Pucker Gallery in Boston, Massachusetts. The Gallery was founded in 1967.